Weathering Landforms: What Is A Tafoni? An interesting landform, tafonis are small cave-like features in granular rock with rounded entrances and smooth walls. A tafone (plural: tafoni) is a geological formation that resembles a small cave with a round entrance and smooth, concave walls. Tafoni are often found in connected networks that have carved into cliffsides, hills, and rocky areas. Tafoni are most commonly formed in granite, sandstone, or sandy limestone and are particularly commonplace in semi-arid to arid desert climates. This formation is easily recognized due to its honeycomb, or sponge-like, appearance. Several theories have been presented to explain tafoni formation, including: freezing-thawing, wetting-drying, and salt weathering. Honeycomb weathering, a form of salt weathering, is the most common explanation. It occurs when salt collects on the surface of permeable rocks, usually by ocean waves, mist, or wind. As the saltwater evaporates, it leaves the salt behind. The salt works its way into the rock pores, where it crystallizes and pushes the pores open further. These enlarged rock pores become susceptible to additional weathering, including the previously mentioned wetting-drying and freezing-thawing cycles. After a significant amount of time, the weathering becomes noticeable in the form of tafoni. Other theories attempt to explain the presence of tafoni in coastal areas. Some researchers believe that, in addition to salt weathering, mollusks and other marine life may also initiate tafoni. 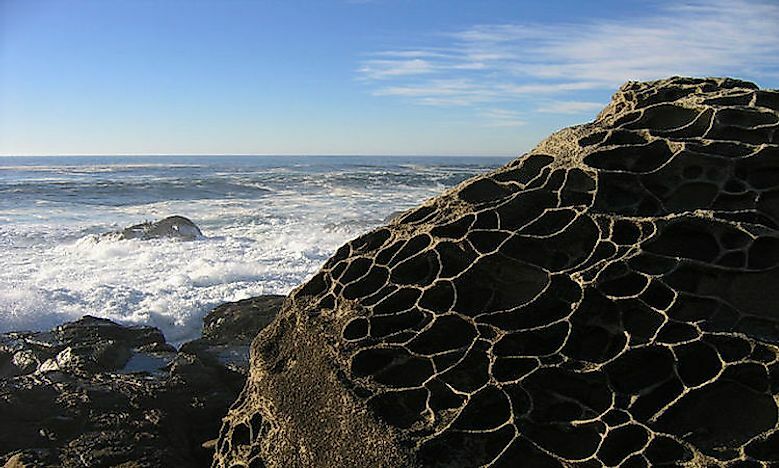 They do this by creating small holes in the rocky coastlines, where they attach themselves and extract minerals. The hole grows larger over time until eventually the mollusk, or other organism, drops off. The hole is then left to the elements, like wind, rain, and tidal water. These work together to create the tafoni formations. Although tafoni has an interesting appearance that attracts attention, it also poses a threat to some ancient architectural ruins. Once it begins, tafoni slowly eats away at the surface of these structures, which can eventually lead to their complete destruction. This weathering effect has been identified at the ancient city of Petra in Jordan as well as along the seawalls of Weston-super-Mare in the United Kingdom. This phenomenon has prompted academic research projects in order to better understand its formation. Some of the research techniques have included the following: use of Scanning Electron Microscope imaging, Electron Diffraction Spectroscopy, Mass Spectrometry, and laboratory reconstruction. Tafoni can be seen at the Altdahn Castle in the Palatinate Forest of Germany. The castle is located on top of a low-lying rocky ledge, part of the surrounding sandstone mountains, in the forest. Because of the varying degrees of hardness of the rocky ledge, weathering has caused some interesting formations in the sandstone. The honeycomb weathering here is particularly noteworthy as it stretches across a significant portion of the rocky area near the castle. The Arches National Park in the state of Utah is another place with an excellent example of tafoni. This park consists of over 2,000 sandstone arches in the middle of the high desert of the Colorado Plateau. The majority of the tafoni can be found at the Navajo and Entrada sandstones. The reason its concentration in this location is that the arches here are made up of ancient sand held together by calcite. The calcite is water-soluble and dissolves in moisture. It is then redeposited in the rocks’ pores, where it crystallizes and eventually results in honeycomb weathering. What Is Weathering? How Many Types Of Weathering Processes Are There?